Culinary Basil Blend is an aromatic blend of organic, basil varieties including dark purple foliage and small and large leaved green foliage varieties. Culinary Basil Blend is an aromatic blend of organic, basil varieties including dark purple foliage and small and large-leaved green foliage varieties. Basil makes an excellent seasoning for many uses. Beautiful as an ornamental and use for cooking, herbals and essential oils. Germination temperature 70-85 deg. in 7-14 days. Approximately 790 seeds/gm., 195 seeds/ 250 mg pkt. Planting and Care Directly sow seeds into fertile garden soil, 1/4” deep, in full sun when all danger of frost has passed and soil temperature is approaching 70 deg. F. Start indoors 5 weeks before last frost date and transplant to the garden or container in a sheltered spot. Water regularly and do not over-fertilize. Thin to 10” (25 cm) apart. Pinch the stem tips to encourage branching. Harvest Cut individual stems and strip the leaves to use fresh. Add to dishes at the end of cooking to preserve the flavorful oils. Hang whole plants or leafy stems in a cool dry spot until completely dry and then remove leaves and store in an airtight container. 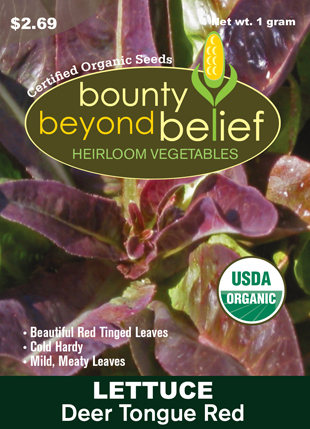 Grow as a tasty micro green and add to salads, sandwiches or as a garnish to fish dishes. Your Health Basil is rich in vitamins K and C and cell protecting flavonoids and the volatile oils are thought to have anti-bacterial properties.